Take a look at your small hamster with her short legs. Would you ever believe that in the wild she can cover miles in a single night? Now look at her cage. How much exercise can she get in that? Face the facts...your hamster is going to spend much of her life in her cage. An no matter how many tubes and modules you join together, you won't be able to give Grace miles of cage to explore. So what's the answer? Well, it's a combination of things. You have to give her as expansive a cage setup as possible. You have to give her as much out-of-the-cage play-time as possible. And you have to give her toys, running wheels, climbers and other playthings to keep her mind occupied and her little legs on the move. The quality of Grace's life is totally up to you. She can't run out and pick out toys to pep up her life. It's you who will have to make that cage a hamsters health club...a fitness center and playground all rolled into one. 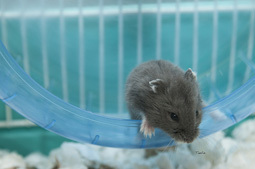 In such a stimulating environment, your hamster will be able to follow her natural instincts and get the workout she needs. She will be able to keep her body in shape and her mind alive. In other words, she will be happy. And a happy hamster is easy to handle and easy to train.